For practicing neurologists interested in breaking into clinical research trials, the prospect has never been easier. The NINDS Clinical Research Collaboration (CRC) has opened its doors to include neurologists and patients outside of traditional academic-based research centers. Ronald L. Schwartz, MD, is one of a growing number of community neurologists who has decided to take advantage of this opportunity. Dr. Schwartz was inspired to enroll after attending an informational session at the 2006 AAN annual meeting. “It can be extremely difficult to break into clinical trials,” said Dr. Schwartz, who has been practicing at the Hattiesburg Clinic in south Mississippi for the past seven years. “But this was a great way to ease into it.” He added that the concept of translating clinical research into community practices can help facilitate better and more efficient use of resources for physicians and subjects. “Many of the NIH institutes have had to rely more heavily on overseas clinical trial sites, because only a small proportion of patients in America participate in clinical research,” said Anne S. Lindblad, PhD, director of the CRC Operations Center. She pointed out that some trials funded by the NINDS, run by strong consortia of investigators and involving patients with chronic incurable neurological conditions, recruit well, but other trials have great difficulties. In other disease specialties — such as cancer and heart disease, for example, there is broad participation of academic and practice-based physicians; in contrast, many NINDS-sponsored trials have experienced lengthy recruitment delays. Community-based neurologists already face lower reimbursement rates for patient care, so the prospect of taking on the additional demands and resources required for managing clinical trials may seem daunting. But the CRC program hopes to make that a less challenging prospect and, in the process, engage more practice-based neurologists. The goal, said Dr. Linblad, is to recruit more patients and promote more timely trial completion. Neurologists have the option to refer patients to studies described on the NINDS CRC Web site or to recruit and follow patients themselves. The program currently has four studies open for enrollment by neurologists: two stroke studies, a combination therapy study for multiple sclerosis, and one that requires blood drawing for a cell and DNA repository of multiple diseases, including dementia with Lewy bodies, epilepsy, motor neuron diseases, multiple system atrophy, Parkinson disease, post-polio syndrome, progressive supranuclear palsy, spinal muscular atrophy, stroke, Tourette syndrome, and transient ischemic attack. Blood samples and donor information are collected and sent to the repository, and from there, to investigators who are doing genetic research. In order to become Level I certified, neurologists are required to complete two 50-minute programs on Good Clinical Practice and Human Subjects Protection and pass a test on each. Once Level I certification is obtained, neurologists may participate in any CRC study; each requires a small amount of further training specific to the study. When the first study patient is entered, neurologists are reimbursed for the patient as well as the related hours of study. William R. Logan, MD, a St. Louis-area neurologist who has been involved in clinical research studies for the past 23 years, began enrolling patients in the Genetic Repository Study after he finished the program last year. He has been an enthusiastic participant ever since. Because a consortium of practices in Dr. Logan's community is taking part in the CRC program, the Operations Center has provided participants with a roving clinical research coordinator to be shared among the centers. Dr. Logan has also enrolled patients in the Secondary Prevention of Small Subcortical Strokes study and has completed the additional training program to enroll patients in the Insulin Resistance Intervention After Stroke Trial. “Once you've completed the training to become certified and have enrolled in one study, the steps needed to take part in others become much easier,” he said. Austin neurologist Ronald Devere, MD, has been involved in clinical trials over the years, and found the experience incomparable. CRC personnel have been extremely conscientious and helpful from start to finish, he said. Dr. Devere completed his registration a year ago, having qualified for certification online. He believes that the gene repository, to which he has enrolled three or four Parkinson disease or stroke patients a week, can accomplish in aggregate what a single site alone cannot. “As a group, private practice neurologists can catapult the collection of information,” he said. Although the neurologists who spoke to Neurology Today seemed to enjoy clinical research, several mentioned that they believe that it is also the right thing to do for patients. Also, being participants has helped them to stay current in neuroscience. “It is eye-opening to meet and listen to the discussions of smart and talented people who are on the cusp of scientific advances,” said Dr. Logan, who participates in monthly study update conference calls. Dr. Schwartz, of Mississippi, has enrolled over 50 patients in the genetics repository and has started screening patients for the Insulin Resistance Intervention After Stroke trial. “The CRC program makes us feel that we are part of the process — when new trials are being developed, we are often asked to provide feedback,” he said. Notwithstanding the enthusiasm of those interviewed here, the number of neurologists who have enrolled patients in the ongoing NINDS clinical trials has been disappointingly low, according to Dr. Lindblad. “At this early stage, one possible explanation is that current NIH trials are not optimal for the practitioner just starting to do research,” she suggested. Those who have never conducted research may find the requirements daunting without the help of a clinical trial coordinator, for example, a registered nurse or health care professional who plays an important role in organizing the studies — recruiting, screening, and interacting with patients; conducting tests and completing documentation; and serving as a liaison between the research site and the sponsor. Whereas academic medical centers may budget for clinical trial coordinators as staff positions — and may use them for numerous studies — the small neurology practice may not be able to afford to keep them on salary. By making clinical trial coordinators available to several community neurologists, the NINDS CRC hope to address this challenge. The specialized nature of the trials selected thus far (with the exception of the gene repository) is probably another barrier. Community neurologists may simply find it difficult to find patients who meet trial requirements. Dr. Avitzur, a neurologist in private practice in Tarrytown, NY, holds academic appointments at Yale University School of Medicine and New York Medical College. She is also the editor in chief of the AAN Web site, AAN.com, and chair of the AAN Practice Management and Technology Subcommittee. For more information about the NINDS CRC program and current studies, visit https://secure.emmes.com/crc/home.htm. 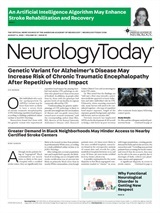 Neurology Today8(9):19-20, May 2, 2008.